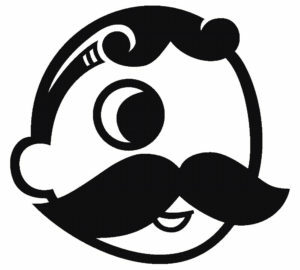 Yesterday I learned a cousin designed Mr. Boh, the one-eyed, mustachioed mascot of National Bohemian Beer, better known in the Baltimore area as Natty Boh. His name was Donald Fenhagen. He was the PR director for the National Brewing Company and, in addition to Mr. Boh, he was part of the team that came up with the “Land of Pleasant Living” slogan for Baltimore. A few years older than my grandfather — Fenhangen’s third cousin — he died in 2003. Though I’m sure my grandfather wouldn’t have known him, it is interesting that both spent World War II serving in the Caribbean. My line and his diverged about two centuries ago. My great-grandfather Allyn Gardner’s great-grandfather Bernard von Hagen immigrated to Baltimore from Germany after the Napoleonic Wars, and von Hagen’s name became anglicized as Fenhagen. Bernard had three sons; I’m descended from the oldest son Thomas (whose grave I looked for on Saturday, even though I don’t know where he is), Donald Fenhagen is descended from a younger son, James. I worked in the former Natty Boh building after I moved to Baltimore in 2006. The Brewer’s Hill development converted the brewery and the office building on O’Donnell and Conkling Streets into office space, and ElderHealth, the company I worked for, rented office space there. The brewery building was nice; it had character, not to mention lots of windows that gave a lot of natural light. The office building, on the other hand, was a formless and unbroken piece of mid-century architecture that was functional but had nothing to commend it. I have to be honest. I am not a fan of Natty Boh. I knew of it from Homicide — I recall an episode where Munch talked about it — and I didn’t try it until 1999. My grandfather died that year, and I drove down to Baltimore to visit my grandmother for a weekend in the autumn. I stopped at a liquor store on Liberty Road — I’m pretty sure it was the liquor store at the Giant shopping center off Offutt Road — to buy something for the weekend, probably intending to get the Sam Adams Boston Lager, and there I saw National Bohemian in bottles. “Munch liked this! Munch raved about this!” I thought, and bought that National Bohemian instead. That evening, I cracked open one of the bottles. I took a swallow. My face scrunched. I took another swallow to confirm that initial impression. Confirmed. National Bohemian was awful. My mistake was in trusting the opinion of a character from a television series. I left the remaining five bottles of the six-pack in the parking lot of the Food Lion up the street when I went home Sunday afternoon. I’ve not had a Natty Boh since. Once sufficed for a lifetime. I will say this for the National Brewing Company, however — my family has been moving in National Bohemian shipping boxes from the early 70s my whole life. I have a few myself. They have proven durable and nigh-indestructible for the past forty years. A familial connection, however distant, to Mr. Boh won’t make me suddenly run out and buy a case of Natty Boh. I have standards! To be fair, it’s not Natty Boh specifically; I’ve had other Bohemians, and I don’t like the style. Nonetheless, there’s something cool in knowing that Baltimore has someone in my extended (and forgotten) family to thank for Mr. Boh and the Land of the Pleasant Living. Header photo Natty Boh Tower Sunset by Elliott Plack, licensed Creative Commons BY-SA 2.0.